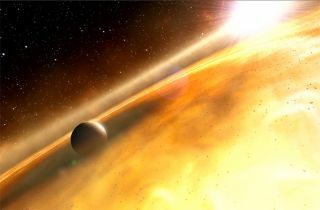 An illustration suggests what an exoplanet may look like orbiting a star. ANALYSIS: Has Kepler Discovered an Alien Megastructure? The comet clump explanation seems to answer many of the mysteries about the strange transit signal. A nearby star, only 1,000 AU from KIC 8462852, could have caused some gravitational perturbations during close approach, possibly sending a swarm of comets toward the star, blotting out up to 22 percent of the star's light from Kepler's view. The exocomet explanation seems reasonable. Although exocomets have been detected around other stars in the past, this would be the first detection of a vast clump of comets big enough to significantly dim the light of a mature F-type star (around 50 percent larger than our sun). However, an observation of this kind would have to be an incredible stroke of luck; for us to have a NASA space telescope looking in the right place at the right time of this rare collection of comets to pass in front of one star of only 150,000 stars in Kepler's field of view (over a very short time period of 4 years), is crazy lucky. But just because it's a serendipitous observation doesn't mean it's not caused by comets; we were just really, really lucky to see it. It is a great piece of research that stands by itself, an outstanding discovery first by citizen scientists poring over publicly-available data and confirmed by an international collaboration of professional astronomers. But then, on Tuesday, an article appeared in The Atlantic; an article that provided a further look into the scientific process of seeking out more extreme possibilities. Once again, for the commenters who were upset at my blogging about these alternate hypotheses, I am in no way concluding that the transit signal observed from KIC 8462852 isn't caused by comets or some other natural phenomenon that we haven't accounted for. I'm exploring a possible avenue of investigation that the astronomers involved in the original research are exploring themselves. Post-doctorate researcher Tabetha Boyajian, at Yale University and lead author of the original paper, spoke with The Atlantic's Ross Andersen, mentioning that she was currently considering "other scenarios" for the strange transit pattern. And, after sharing the data with Penn State University astronomer Jason Wright, who is planning a follow-up publication, one of those other scenarios came to light: the strange transit signal from KIC 8462852 might be caused by a huge artificial structure. Wright and his co-authors say the unusual star's light pattern is consistent with a "swarm of megastructures," perhaps stellar-light collectors, technology designed to catch energy from the star. As discussed in Wednesday's Discovery News report, should this signal really be artificial, it could be the first evidence of an advanced alien intelligence that is well on its way to becoming a Type II Kardashev civilization. This is a remote possibility but if all other explanations are exhausted, why not test the alien hypothesis? So, what's next? Unfortunately, with Kepler's primary mission over, we only have 4 years of transit data from KIC 8462852 and only 2 key transit events to study. The first dip in starlight occurred for one week in 2011 and then the second significant event was actually a series of variations over the course of a few months in 2013. That's all we have for now. The researchers are now hoping to get some observing time on a radio observatory to "eavesdrop" on the star in the hope of carrying out a "directed SETI" campaign, hunting for artificial radio signals emanating from the star system. If they draw a blank on this observing run — and, let's face it, the chances of detecting alien communications are still as slim as ever — it doesn't necessarily mean the "structure" isn't artificial, it could just mean that this hypothetical race isn't communicating via radio waves… or it could mean the alien civilization is no longer there. ANALYSIS: Could Kepler Detect Alien Artifacts? Our galaxy, which contains hundreds of billions of stars and countless more planets, is over 13 billion years old. The human race has evolved in the tiniest fraction of this time and modern astronomy has only just opened our eyes to the cosmos over the last couple of hundred years. The likelihood of seeing a thriving civilization of advanced extraterrestrials building some kind of solar array around KIC 8462852 at this precise moment in time is extremely tiny. So it is more likely that if the radio signal hunt turns up empty handed, but the object is proven to be an artificial megastructure, it could be the remnant of a civilization that has come and gone — it could be a huge artifact of a bygone alien age. Seeking out alien artifacts is not a new idea. The Search for Extraterrestrial Artifacts (SETA) and, indeed, the Search for Extraterrestrial Technology (SETT) are both variations of the Search for Extraterrestrial Intelligence (SETI) theme and one such project recently concluded that our local galaxy is devoid of advanced alien beings that can harness all the energy from their star. Coincidentally, British theoretical physicist Stephen Hawking re-iterated his views on encountering an alien race in a recent interview. Hawking has warned against transmitting signals into space before, lest we get noticed and invaded/assimilated/blended by vastly more powerful entities. For those that have expressed concern about a potentially aggressive race of aliens sending an armada of battleships at Earth from KIC 8462852, it's worth remembering that we are seeing the light from the star that was generated 1,500 years ago — it's 1,500 light years away, so it's taken light that long to travel the distance. If, 1,500 years ago, that hypothetical alien race noticed Earth, it wouldn't have detected any transmissions (radio or otherwise) — as advanced as the Roman Empire was around 500 AD, it's highly doubtful that anything outwardly resembling an intelligent species would have been noticed at those interstellar distances. ANALYSIS: Alien ‘Star Engine' Detectable in Exoplanet Data? But what of our resources? Earth, after all, occupies the habitable zone of our star and it has done for a few billion years, possessing liquid water in abundance, now supporting a thriving biosphere — perhaps a space-traveling alien race would want to take up home here? Well, to our hypothetical alien explorers/conquerors, the sheer distance between us would be Earth's greatest defense. Regardless of how advanced a civilization becomes, they are still bound by physics and limited by the speed of light. A trip that distance (assuming the warp drive isn't out there, somewhere) would take hundreds of thousands or even millions of years by "conventional" means. Also, as the Kepler mission itself is teaching us, our galaxy is filled with a bountiful array of small rocky worlds. It seems, in this early stage of discovery at least, that there are many small worlds orbiting within the habitable zones of their stars, potentially also with global oceans of liquid water. If they wanted to invade purely for our resources, there's probably some easier-to-reach options out there. All these ideas are pure conjecture as we don't have the faintest clue as to whether there's any other life form out there, let alone an intelligent civilization building solar energy collectors around a certain F-type star in our little corner of the galaxy. But as we look deeper into the cosmos through an increasingly defined lens, we're changing our perspective on the universe. Although this new research into KIC 8462852 most likely has an elegant, natural explanation, probably centering around a huge clump of comets, speculation about the possibilities of of life in our galaxy is no bad thing. Indeed, the reasons why we haven't detected anything even remotely intelligent elsewhere in the galaxy is a paradox that defies our very existence. If life is inevitable in the universe, and we know the ingredients are out there to spark life, where is everybody? Now we are developing the technology to directly probe the orbits around other stars in the shape of Kepler and other planned exoplanet hunting missions, we are in a very privileged time for our civilization; we can speculate, hypothesize and test our theories about alien life with precision that, until only a few years ago, we wouldn't have dreamed. So on this voyage of discovery, right at this moment, a few astronomers are investigating a couple of bizarre light curves discovered by citizen scientists and analyzed by astronomers to see if something artificial is at play. In my view, this is an awesome thing.